Okay guys, help me out here. The in-laws are visiting from “outside” for the first time in three years. Dad can’t make the hike to the cabin, so he’s staying at a motel in town, but Mom’s gamely hiking the trail, even with her bad heart. She’s really making the effort necessary to get out here, to spend time at the cabin, to see us, and—I hasten to add—to see you. Yes, you! 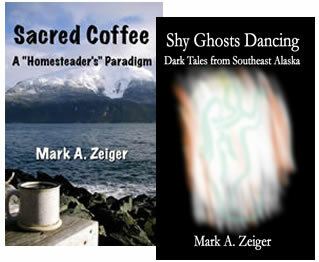 You know you’re one of Southeast Alaska’s greatest draws, so don’t be coy. You know that people shell out big bucks, talking about how important it is to keep family ties strong, to see the one grandchild who lives in a different state than all the others, and all that, but the real reason is a chance to see you big, beautiful creatures up close. Eagles are a thrill, sea lions, porpoises, seals, otters are great, moose and bears are cool, but you’re the real draw. So come on, where the heck are you? 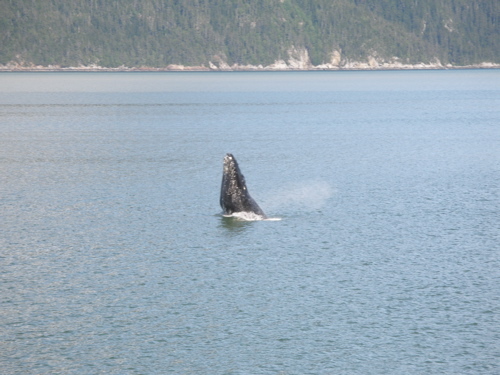 Dear whales of Lynn Canal, remember the show you put on for the in-laws in 2008? More please! (Photo: Aly Zeiger). Yes, I know the eulachon run is just now winding down. I know it’s five times larger than last year. I understand the temptation to spend all your time in the mouths of the Chilkat and Chilkoot Rivers, scooping up a fish that’s more numerous, slower, and way fattier than the herring that are wandering listlessly up and down our beach. Even so, we’re on a schedule here, cetaceans—they leave on Saturday! So far, all you’ve done is wander back and forth near the far shore of the fjord. Thankfully, it’s been nice and clear, so we can see your spouts, and hear you when you exhale loudly, making that strange bellowing noise you do, but it’s hardly worth the price of the ticket, now, is it? We need some right-off-the-beach thrills, please. Are you going to show up, or are you going to hide till they go away, as you so often do? You know, if you fix the boat, Dad won’t have to walk, you can give him a ride :^). Not a chance, Don. We have plenty of operable boats to bring visitors around, but, if you’ve seen the photos of our beach on the main pages of AKZeigers.com, you see the docking problem we have. Anyone arriving by water must negotiate the rocky beach. We’ve brought Mom and/or Dad around by water in the past, but Dad’s reached the point where he can’t handle the short beach climb or the trail. One of the few downsides of this lifestyle is inaccessibility to friends and relatives with lowered mobility. It’s a challenge!